Does U.S. Cook The Books On GDP Reporting? The Economist this week explores how the U.S. reports certain economic stats, including whether the U.S. over-reports GDP only to revise it down later. It’s a short, worthwhile read—graph, excerpt on GDP, and story link below. The first of three 1Q2010 GDP readings came out last week at 1.8%, down from 3.1% in 4Q2010. The second reading for Q1 is May 26. A third cosmetic treatment is the way quarterly GDP figures are published. European press releases give the increase in GDP during the latest quarter—a rise of 0.9%, say. But Americans annualise quarterly growth, so an identical increase would be announced as a more impressive-sounding growth rate of 3.6%. Much more important, European economies’ initial estimates of GDP growth tend to be more cautious than those in America. 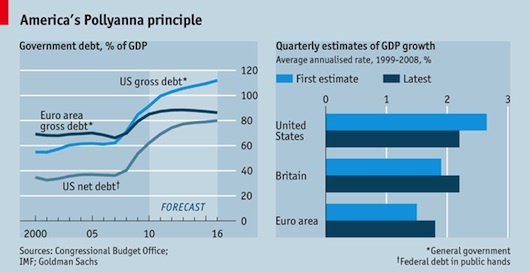 Kevin Daly, an economist at Goldman Sachs, estimates that during the ten years to 2008, America’s quarterly GDP growth rate was, on average, revised down between the first and final published estimates by an annualised 0.5 percentage points. In contrast, GDP figures in the euro area were revised up by an average of 0.3 points. This matters because financial markets and the media focus heavily on the first estimate, but largely ignore revisions several years later. A more controversial issue is the extent to which different methods of measurement distort international comparisons of GDP growth. A decade ago some studies suggested that if America compiled its national accounts in the same way as European countries did, its real growth rate might be reduced by between a quarter and half a percentage point.